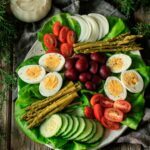 Irish pub salad is a simple, healthy lunch idea for St. Patrick’s Day alongside soda bread or potato soup. Forget the corned beef and try something new! 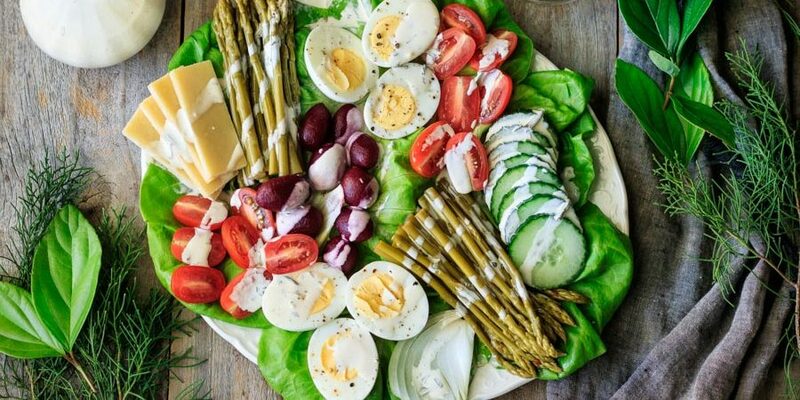 Fill your plate with green vegetables, boiled eggs, cucumber, pickled beets, and crisp lettuce—all drizzled with the perfect salad dressing. Are you looking for something different to serve on St. Patrick’s Day? Eating an Irish pub salad could be your answer. 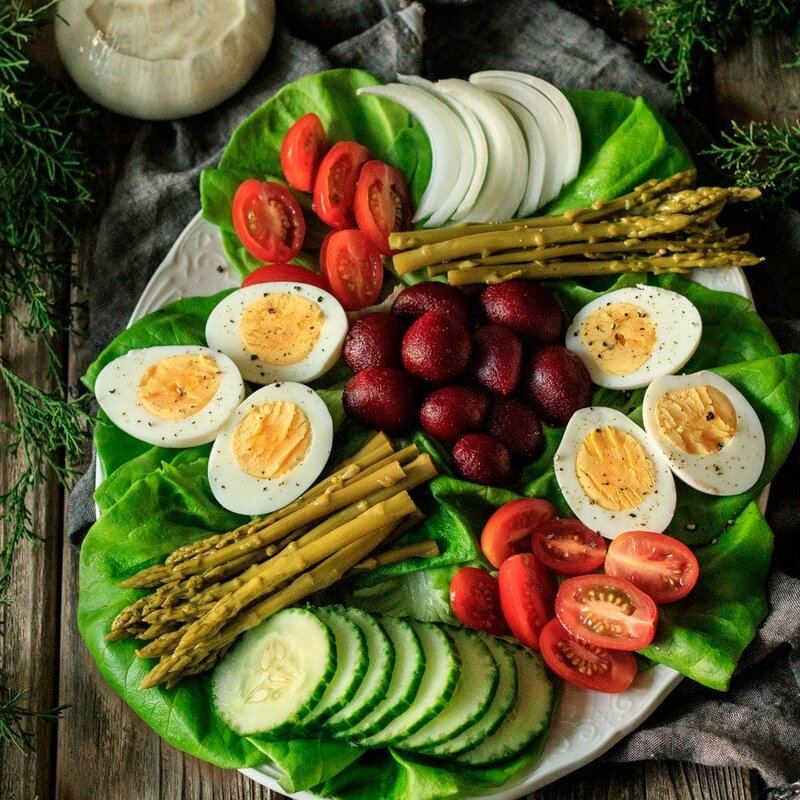 Like the French’s salade Niçoise, it is a composed salad. Not sure what a composed salad is? Well, it’s a salad where the ingredients are artfully arranged on top of a bed of fresh lettuce. My girls and I love having composed salads since they are so pretty. It also is a creative way to break up the monotony of the typical tossed salad. What is an Irish pub salad? What are the four parts of a salad? Use canning jars: Wash the jar and lids in hot water. 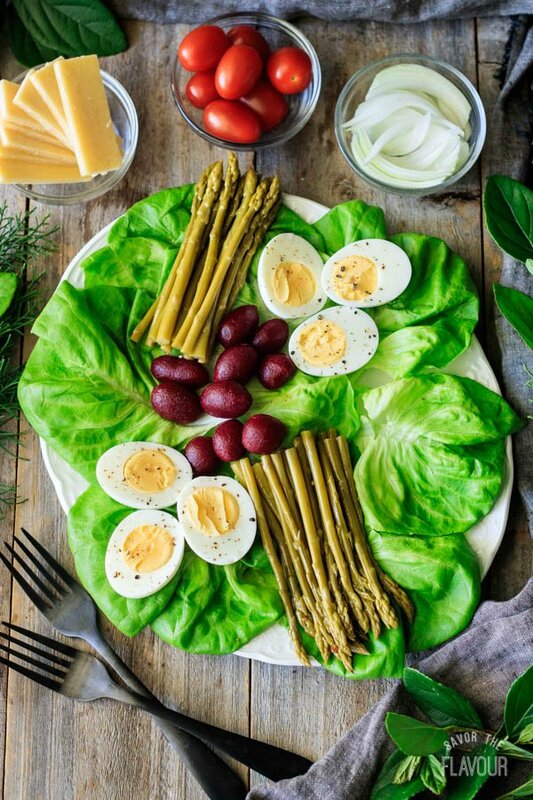 Prep vegetables: Trim off green bean ends, and the tough stalks on asparagus. Add spices to bottom of jar: Try using garlic, fresh dill, mustard seeds, peppercorns, sea salt, oregano and red pepper flakes. Blanch: Green beans and asparagus for 2 to 3 minutes in boiling water then shock in ice water bath to retain color. Make brine: equal parts water to vinegar with salt and sugar then pour into jars leaving 1/2 inch. Tap jar on counter: This removes the air bubbles then seal jar. Cool at room temperature. Store in fridge. Wait 48 hours before using. How do you mellow an onion? Ice water: To retain it’s crispness, soak a cut onion for 15 minutes. Vinegar, Lemon or Lime juice: Will soften the cut onion, if soaked for 15 minutes, and will have a sour taste. Baking soda solution: 1 tablespoon baking soda to 1 cup water. Soak for 15 minutes then rinse. Milk: Will soften the cut onion, if soaked for 15 minutes. Salt: Will soften the texture, sprinkle salt on a cut onion, wait 15 minutes then rinse the salt off. High heat: Cook a cut onion on high heat for one to two minutes. Find large loose heads, like an open rose. Make sure it has even green coloring. If you scratch the stalk, it will smell sweet or bitter. This lettuce is often packaged in plastic containers, sometimes with the root. 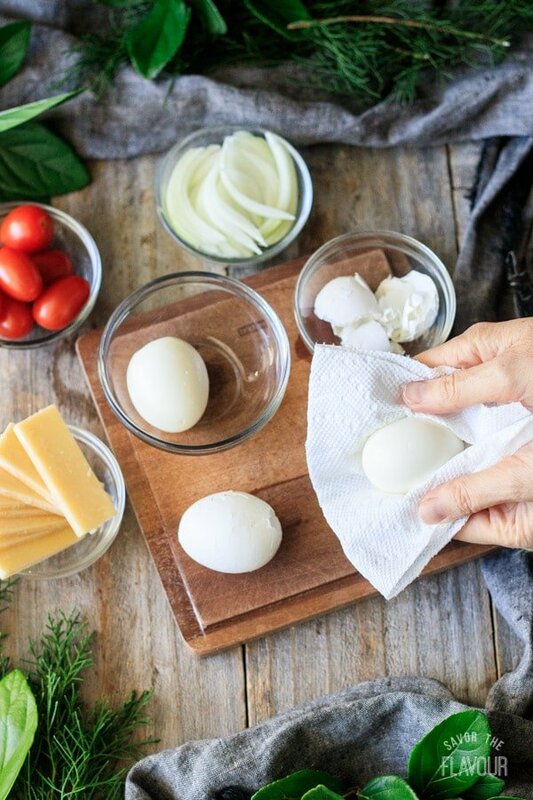 Start making the boiled eggs by adding white vinegar to the pot of water, then bring it to a boil. Carefully lower the eggs into the water with a spoon. Lower the temperature to medium low and put the lid askew. Cook for 9 minutes, then immediately drain the eggs and place them in an ice water bath to cool completely. Peel and rinse the eggs to remove any shell fragments. Pat dry with paper towel. 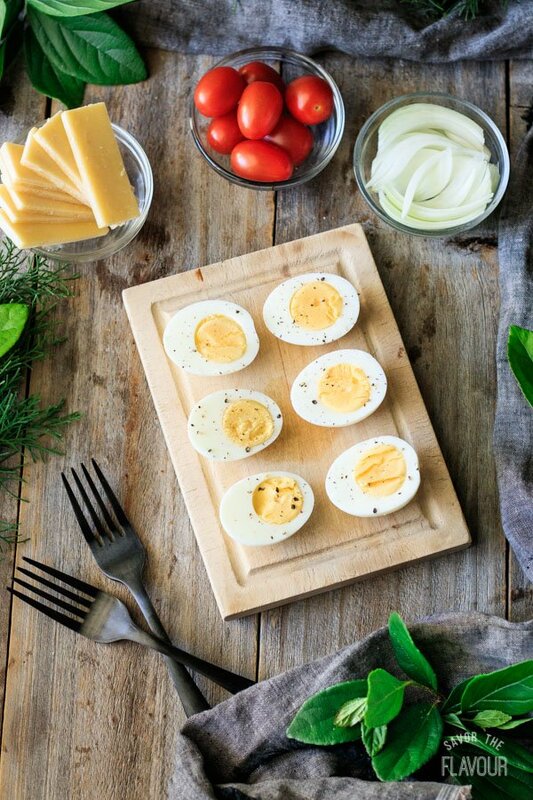 Slice the eggs in half and sprinkle with black pepper. 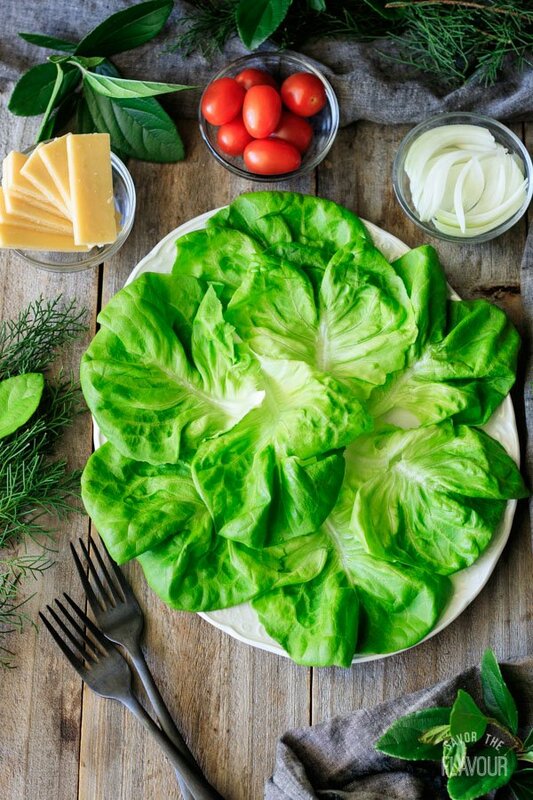 Rinse the Boston lettuce, pat it dry, and line the platter with 8 large leaves. 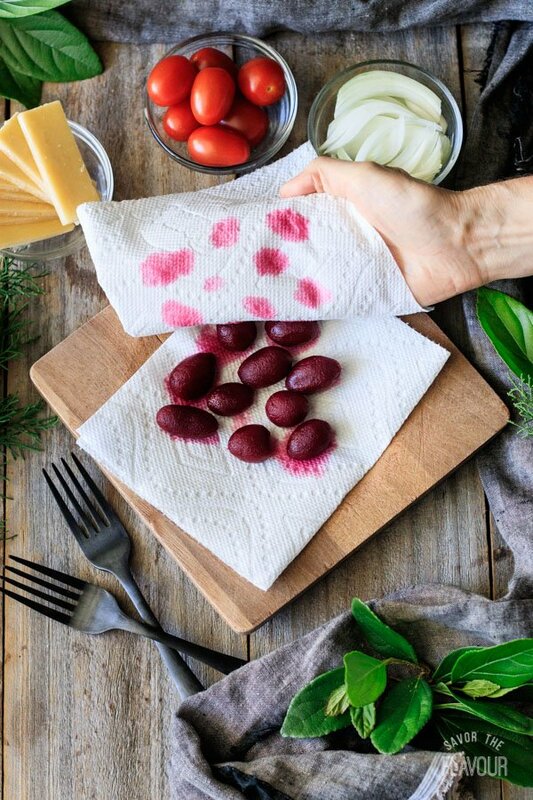 Blot the baby beets with paper towel so they don’t bleed. 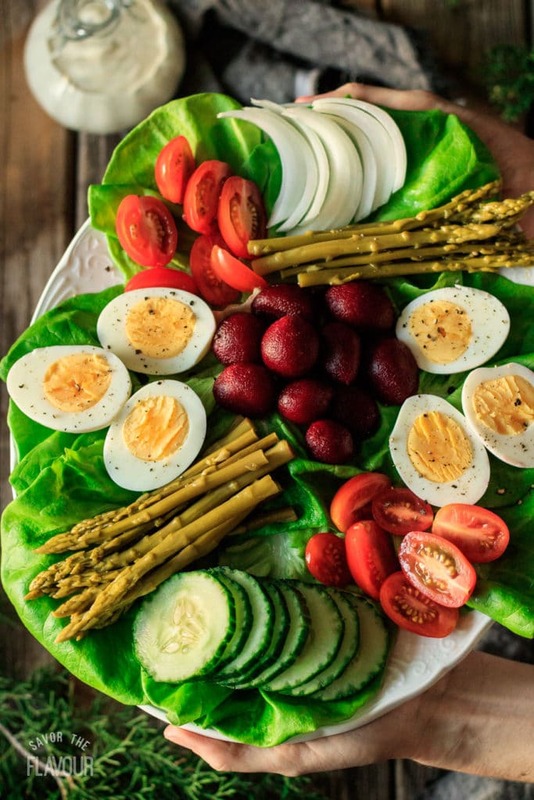 Add the boiled eggs, beets, and asparagus. Make sure the ends of the asparagus line up for a neater appearance. Wash and dry the English cucumber. Score the skin with a fork and slice. Rinse the grape tomatoes, dry them with paper towel, and slice in half lengthwise. Slice and separate one quarter of a sweet onion. Slice the Irish cheddar cheese, stack the slices, then them fan out near the edge of the platter. Just before serving, drizzle with a homemade creamy tarragon dressing. The recipe is below. Serve with a buttered slice of crusty Irish bread. Popular choices in the U.S. are Irish soda bread, Irish brown bread, or boxty bread. 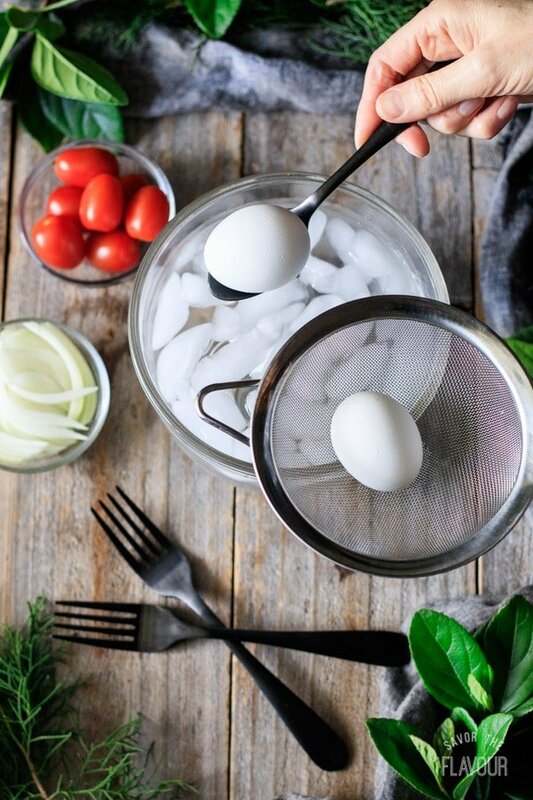 Prep all the ingredients ahead of time. 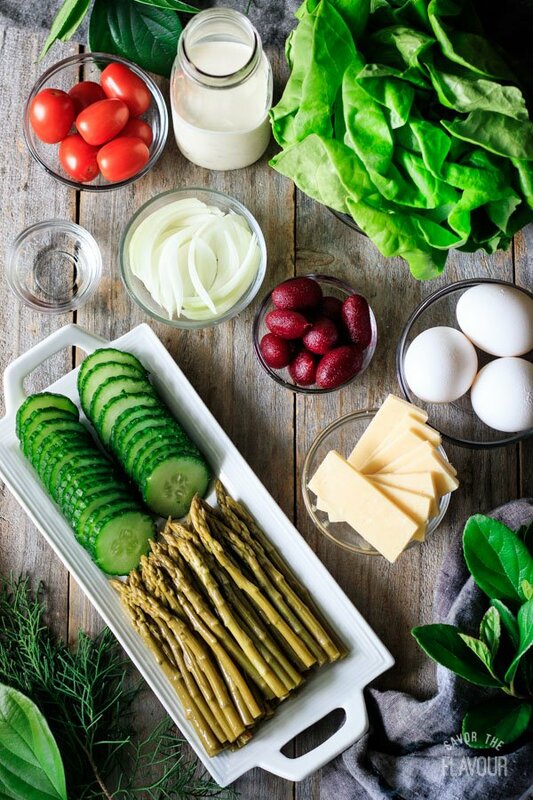 Arrange the ingredients in groups on top of the lettuce. Use a squeeze bottle for the dressing for easy drizzling. Want a starch? Add boiled fingerling or baby potatoes. Want snappy vegetables? Blanch some green beans to add to the salad. Need more crunch? Add homemade Irish soda bread croutons. Want it tossed? Tear the greens into bite-sized pieces and pile the other ingredients on top. Serve the salad with savory Irish soda bread, Irish brown bread, or boxty bread. Need meat? Add smoked salmon. Looking for delicious Irish food for St. Patrick’s Day? Traditional Dublin Coddle: it only takes a few ingredients to make this hearty Irish stew. Chip Butty on Waterford Blaa: this delicious Irish sandwich is made from soft white bread and french fries. Smoky Cheese, Potato, and Ham Soup: an easy soup flavored with smoked Gouda and roasted garlic. The pleasure of a 5-star review of this Irish pub salad recipe would be greatly appreciated. 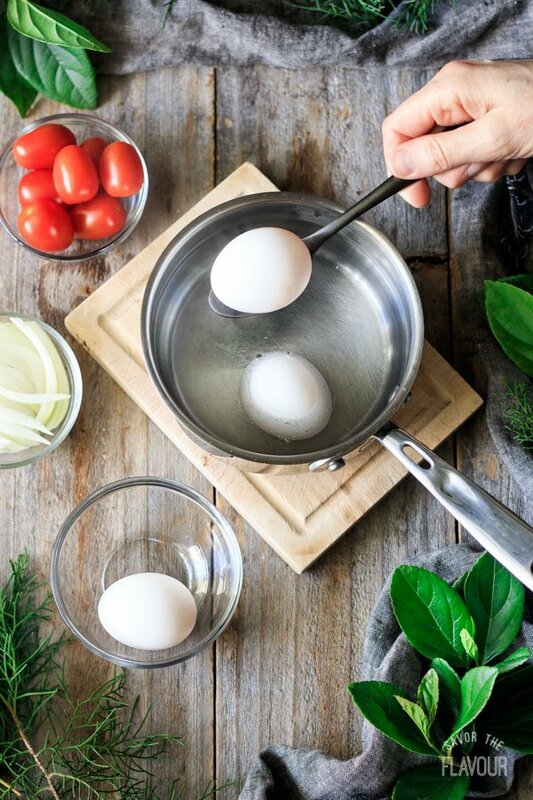 Fill a small saucepan half full with water and stir in 1 tablespoon of white vinegar to help the eggs not to crack as they cook. Cover and bring to a boil, then gently lower the 3 eggs into the boiling water with a spoon. Lower the heat to a simmer and place the lid on askew. Cook for 9 minutes, then immediately drain and place the eggs in an ice water bath to stop the cooking process and to speed up the cooling. Once cool, peel the eggs and rinse off any shell fragments, then blot each egg dry with a paper towel. Halve the eggs lengthwise and sprinkle with black pepper. Tear off 8 pieces of Boston lettuce. Rinse and blot dry with paper towel. 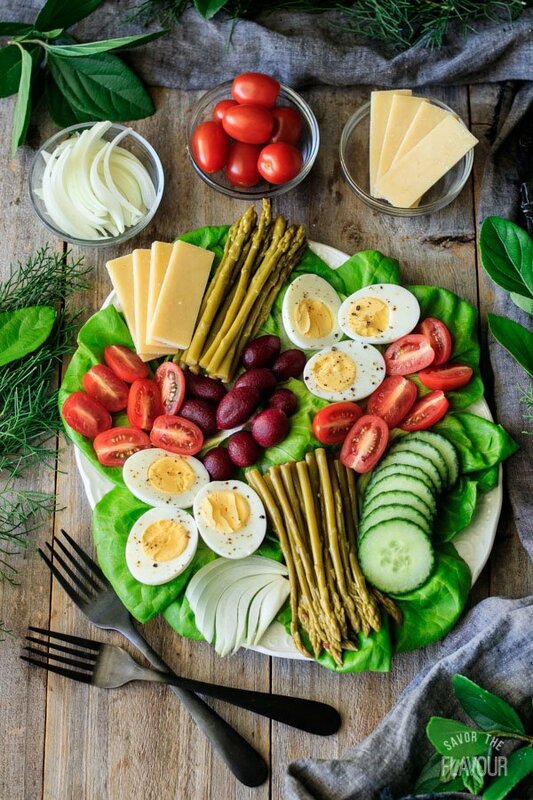 Arrange most of the leaves around the edge of the platter and put one or two in the middle to make a pretty base for the other salad ingredients. Get all the salad ingredients ready. Cut a quarter of a sweet onion, then slice it to get 12 curved slices. Mellow the onion by soaking it in ice water, vinegar, milk or sprinkle it with salt. Wait 15 minutes then rinse. Blot dry the baby beets so the red juice doesn’t bleed. Cut a cucumber in half. 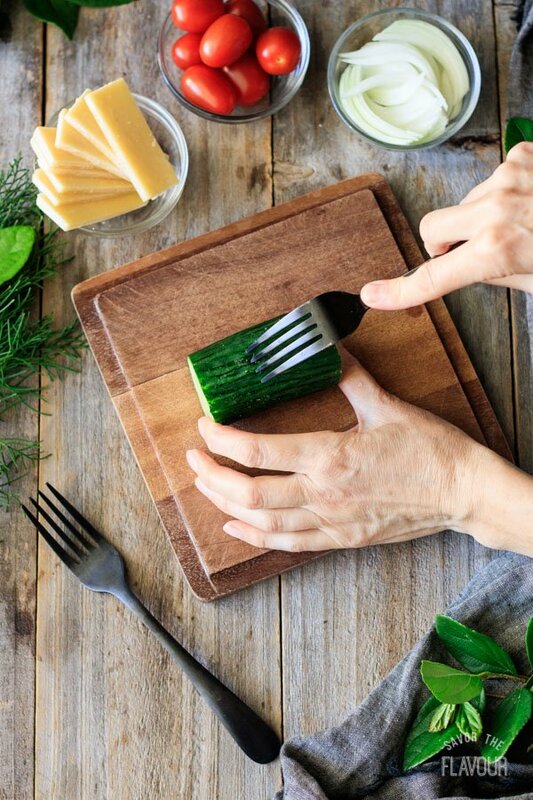 Score the outside of a cucumber with the tongs of a fork then thinly slice it. Rinse and halve the grape tomatoes lengthwise. Slice the Irish Dubliner cheddar cheese 1/8 inch thick. Composing the salad is the fun part. 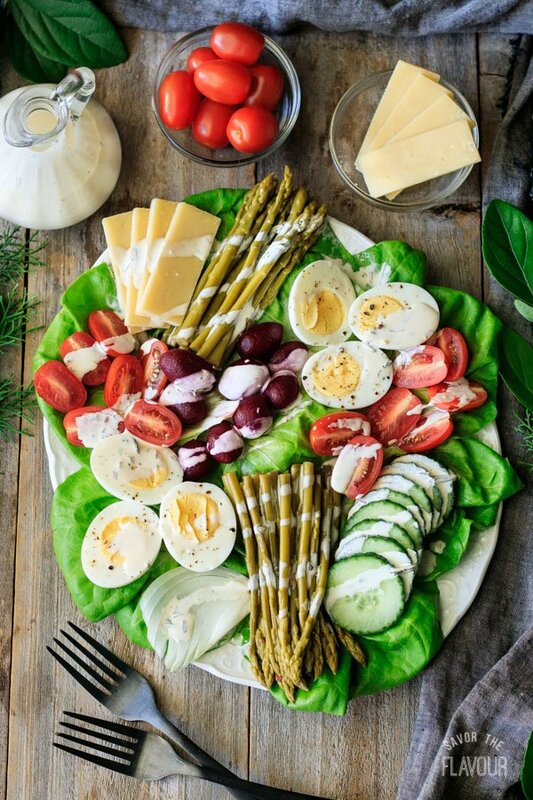 Arrange the salad ingredients in a way that looks pleasing to you on a large platter or on individual plates. You might want to have two sections for most of the ingredients and one section for the cheese, sweet onion, and beets. 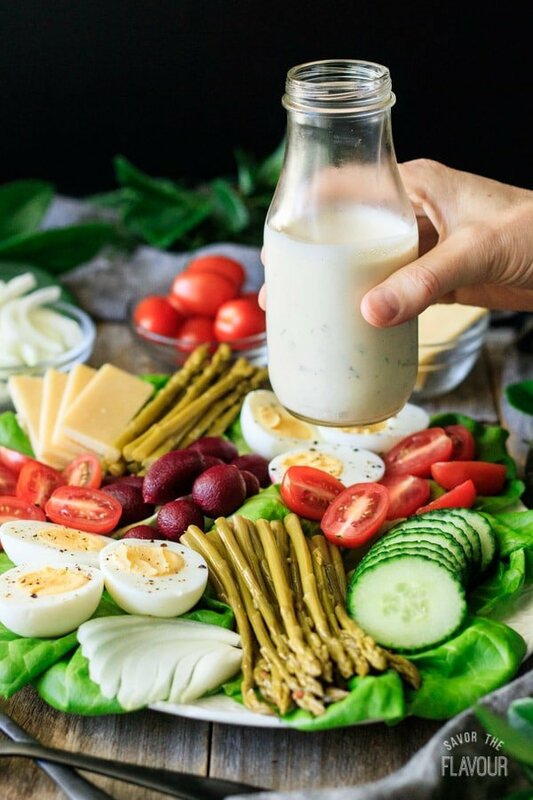 Whisk together the mayonnaise, vinegar, tarragon, and Dijon mustard in a medium bowl. Sprinkle in the salt and black pepper, then add a pinch of sugar. Gradually add the water to get it the right pouring consistency. Whisk until smooth, then taste and adjust seasonings if necessary. 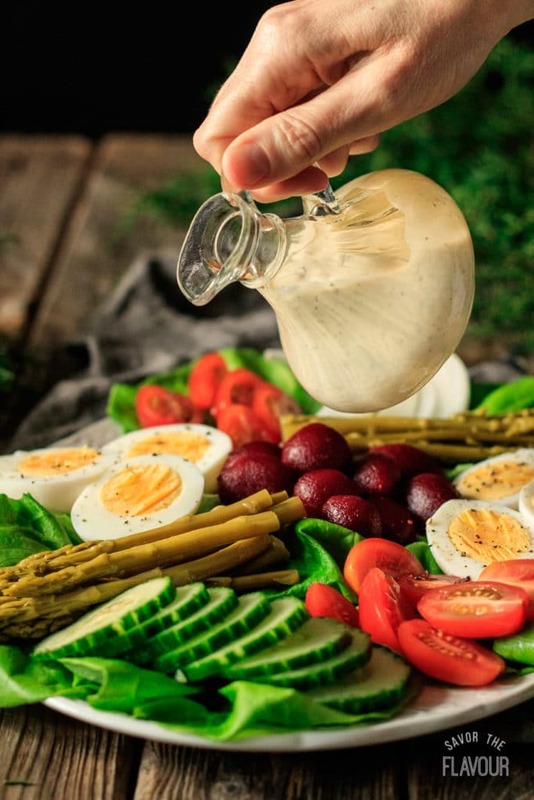 Just before serving, drizzle the homemade salad dressing on the salad. Serve with Irish soda bread, boxty bread, or Irish brown bread. Use it as a side dish with an Irish chip butty sandwich or with a steaming bowl of Dublin coddle or smoky cheese, potato, and ham soup. The pleasure of a five star review on this recipe would be greatly appreciated. Made this with a potato leek soup and it was a hit! 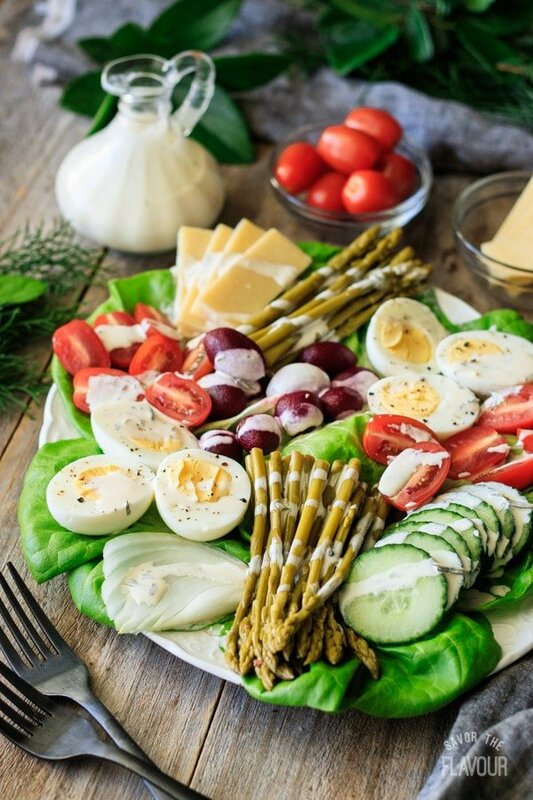 Loved the rich Dijon dressing…perfect St. Patrick’s Day appetizer.